Demonstrators protesting a fatal police shooting that occurred earlier this week briefly shut down I-5 and blocked a downtown arena before an NBA game Thursday night. 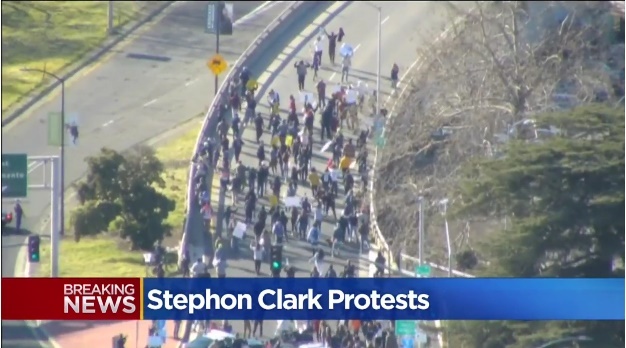 The protests are over the shooting death of Stephon Clark, 22, a suspect in a string of vehicle break-ins. Clark was killed at the end of a foot pursuit involving two Sacramento police officers. He was reportedly unarmed at the time. He was reportedly holding a cellphone and uncooperative with police commands during the nighttime shooting. At one point, protesters trying to push through the NBA arena's employees’ entrance and were physically confronted by security and Sacramento police. Officers deployed pepper balls and mounted police were also called to the scene, CBS Sacramento reports.